Kids love making a snowman in the Winter, and this snowman ornament couldn't be more welcoming or fun. 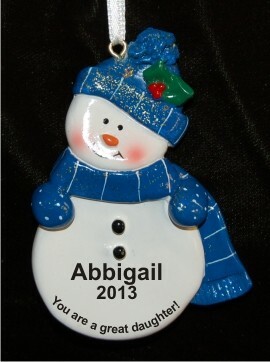 Personalize our blue snowman ornament with his or her name and the year. The resin snowman ornament measures 3.2"H, and arrives in our black velvet bag, ready to make a great personalized Christmas gift.